Winners of the Elias Fawcett Award for Outstanding Chamber Ensemble in the 2012 Royal Overseas Leagues Competition, Trio Anima are a group “with a growing reputation for championing the little-known corner of the chamber music repertoire” (Tony Goldman, Haslemere Herald). The trio combine passion and energy for their repertoire, with innovative and collaborative programming. The group held a Chamber Music Fellowship at the Guildhall School of Music and Drama from 2010-2011, and gave concerts on the Countess of Munster Recital Scheme from 2010-2012. They are now part of Live Music Now! They have had success in competitions, both in the Royal Overseas League and the 2007 Camac Harps Chamber Ensemble Competition where they were awarded First Prize. 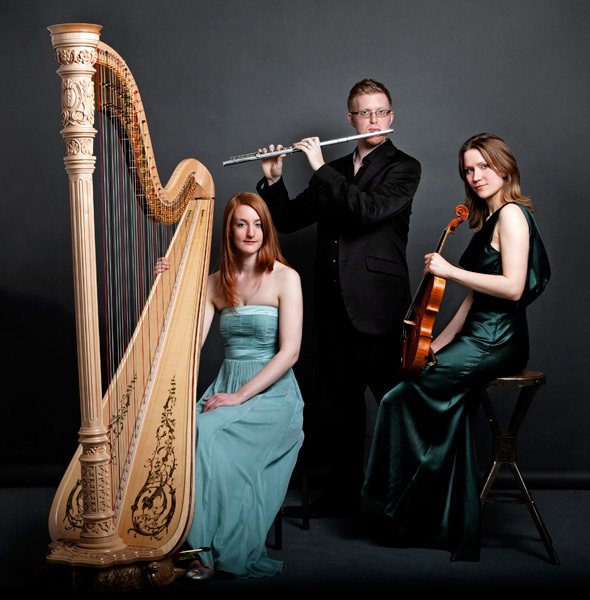 Trio Anima began working together in October 2006 at the Guildhall School of Music and Drama. Their first performance together was of Sofia Gubaidulina’s Garten Von Freuden Und Traurigkeiten, in the BBC Composers Festival 2007. The composer was present at this concert and hailed the performance as “marvellous!” Since then, the trio have performed widely across the UK and further afield, including a highly successful tour of France, performing in Paris, Pithivers and the Orléans Conservatoire. Reports of this tour described their performance as “daring, audacious and simply magnificent” (Le Republique du Centre, Orléans). Trio Anima champion the work of contemporary composers, giving the world premiere of Francesco Coll’s ‘...de voz aceitunada’ at the Richmond Concert Society, and Sasha Siem’s ‘White Dictionary’ at the Royal Opera House as part of the “Operashots” series. Regular performances in London have included a return visit to St. Martin-in-the-Fields, for a concert in the “New Music Series”, and a recital for the Bloomsbury Festival where they premiered Joseph Landers’ ‘Four Thames Crossings’. The trio has participated in an Aldeburgh residency with Dr. David Dolan, working on classical improvisation and performing with the Navarra Quartet. They continue to develop their skills as classical improvisers, including this in concerts by taking ideas or thematic material from the audience. Matthew Featherstone was appointed Principal Flute of the BBC National Orchestra of Wales in September 2012. He has also appeared as guest principal flute with the Ulster Orchestra and Britten Sinfonia. As a solo recitalist who was awarded the Royal Overseas League Wind Prize in February 2012, Matthew has enjoyed travelling around the UK to perform recitals with pianist Philip Shannon on the Countess of Munster Recital Scheme, as well as performing in St. John’s Smith Square and the Queen Elizabeth Hall. He performed Ferneyhough’s Cassandra’s Dream Song for solo flute at the Barbican in May 2011, broadcast live by BBC Radio 3, and recently made his concerto debut with Southbank Sinfonia. During Matthew’s studies at the Guildhall School of Music and Drama he was awarded a Worshipful Company of Musicians Busenhart-Morgan-Evans Award as well as awards from the MBF, the Countess of Munster Trust and the Martin Musical Scholarship Fund. Described as a ‘remarkable talent’ for her performance of Mozart’s Sinfonia Concertante with violinst Tasmin Little, British violist Rosalind Ventris is quickly emerging as one of the most promising young artists of her generation. Aged 17, she was the youngest competitor at the 2006 Lionel Tertis International Viola Competition and Workshop, where she received the Gwynne Edwards Memorial Prize for the most promising British entrant, and the EUCO prize. She made her London concerto debut the following year, performing Hindemith’s viola concerto ‘Der Schwanendreher’. Rosalind is currently based in London, giving concerts throughout the UK and abroad. Forthcoming engagements include performances at the Wigmore Hall, London, the Slovak Philharmonic, Bratislava, Het Concertgebouw Amsterdam, Aldeburgh Festival, and St. Martin-in-the-Fields, London. Anneke Hodnett studied at the Guildhall School of Music & Drama. She was awarded her BMus with Distinction, and in September 2010 was awarded her MMus (Distinction) from the Guildhall Artist Programme. In June 2010 Anneke won the harp position on the London Symphony Orchestra String Academy, which culminated in a concerto performance of the Debussy Danses in LSO St. Luke’s. Other concerto appearances have included the Handel Harp Concerto with The Handel Collection, and further performances of the Debussy Danses. Solo recitals have included performances at the Deal, Harrogate, and St. Lawrence Jewry Festivals. Anneke performs solo and chamber music across the UK for Live Music Now! Contemporary music experience includes the premiere and recording of new works for octet with musicians from the BBC Symphony Orchestra, a performance at the Wigmore Hall as part of the Voiceworks Series and live broadcasts on BBC Radio 3.